Recently I discovered Crust, an amazing restaurant in Wicker Park, Chicago. I had never heard of it before, but someone suggested the eatery to my family and I. I was expecting a typical Panera or Corner Bakery type of place. But Crust, an organic and eco-friendly restaurant, left me pleasantly surprised. First and most importantly, the food was completely fresh. The salads were crisp and appetizers were all freshly prepared and looked great. The restaurant is chiefly known for its’ pizzas, and I am not surpirsed as to why. Normally I don’t really like or eat pizza, but Crust uses such delicious ingredients that I could have eaten two whole pizzas by myself. The eatery offers organic appetizers, entrees, and even organic desserts. The menu will please anyone tastes, as a variety of foods is offered from vegetarian friendly salads, to calzones and chicken sandwiches. Another great thing about the establishment was the eye-catching interior. When you first walk in, you can’t help but notice a big brick oven covered in small colored glass tiles. The decor is very contemporary and modern. While I was there, I enjoyed sitting in their charming back patio, which feaures black fences covered in vines and white curtains. The restaurant is also completly smoke-free, even while dining on their front and back patios. I give the restaurant five stars, for its’ friendly service, the fact that it’s eco-friendly, the great food and great atmosphere. Although I wouldn’t recommend this restaurant to anyone looking for a cheap lunch, Crust is definitely worth checking out and enjoying. Spring 2009 runways showed a lot of brights and florals, as would be expected for that time of year. 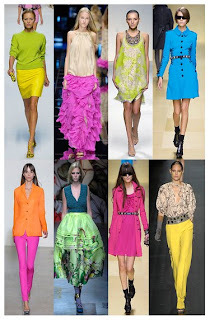 Suprisingly though, the Fall 2009 shows also presented neon and bright colors. While many people enjoy the colorful garments, neons and brights are often seen as hard to wear without making someone look like a glowstick or highlighter. Some may still be wondering, what’s the easiest way to wear neons and brights? The most flattering and chic way to wear them is to pair them with black or neutral colors. A hot pink dress makes a statement, but still looks classy when worn with black tights and a black belt. Another easy way to brighten your style is through accessories, such as bright green or pink shoes, bright yellow bags and skinny neon belts. It is important to keep in mind that a little goes a long way when it comes to this trend. If you just want to add a little hint of neon to your look, try some of this season’s newest makeup and nail polish shades, including Essie’s Perky Purple. For even more about this Fall 09 trend, check out this short clip from Harper’s Bazaar. For suburban girls, a common complaint is lack of places to find unique and fashionable clothes that do not come from the mall. Most girls who do not live in downtown Chicago feel they have to go too far to find the clothes that they want and need to keep from looking like every other girl in their town. Nika le Butik offers those girls hope. This charming boutique is located in Park Ridge, a suburb of Chicago and offers suburban girls downtown worthy styles, in an easier to reach location. I visited the boutique to get a better look, and was very happy with what I saw. The boutique offers very friendly service, trendy clothing, a nice interior, and celebrity inspired fashion garments. All of the clothes are hand-picked for retail and are inspired by current trends worn by celebrities. The store offers an intimate and classy shopping experience that is easily accessible. I sat down with Nika le Butik owner Monika Crossin, to get some more information on the history behind her boutique, and the garments inside. Is there any significance to the name of your boutique? Why did you pick Park Ridge as your location? What demographic is your boutique targeted towards? What is the predominant style? Is there just one or many different styles? What makes your boutique special or what makes it standout from others in Chicago and its’ surrounding suburbs? What is your favorite garment/piece/outfit/accessory that you are selling at the moment? What makes your garments different or unique? Have no fear suburban girls, you can still find the clothes you want without the long trip downtown, or without looking like a mall clone. For those who believe that vintage clothes are the only ones worth buying, vintage is not just a fashion trend- it’s a lifestyle. With an increase in awareness and many people choosing to live a “greener” lifestyle, vintage fashion fits perfectly into an environmentally-conscious fashionista’s closet. One might be wondering what puts vintage fashion into this category. I especially love recycling vintage bed linens and vintage household fabrics like tablecloths and curtains with openwork lace and handwork such as embroidery and tucks. Many of my vintage fabrics are scouted from a local thrift store that supports an orphanage. I love…that I am rescuing wonderful fabrics and garments to be used again. In a world full of mass consumption and production, vintage is the one style that allows us to recycle our clothes and make use of old materials and fabrics. A torn dress that is deemed unwearable, can be carefully reconstructed into a new and unique garment, rather than just thrown in the trash. Since vintage fashion is usually made of reconstructed older pieces, the outcome is a never-before-seen item that is sure to stand out. Yes, one can wear organic cotton clothing or pieces made with natural fabrics and dyes, but recycling old clothing is the best way to help our planet. The vintage lifestyle and fashions are unique, environmentally friendly, and provide long lasting garments. Vintage clothes look good, create a statement and help us express our individualities. When you are saving the planet and looking good while doing it, there’s nothing you can lose by buying vintage.